This article is biased. Its aim is to urge the “Palestinianisation” of both discourse and awareness of daily and mundane particularities. Among the mundane are the two meals of hummus and falafel, which are interlinked with Palestinian cuisine. I believe that it is necessary to develop an understanding of them as a significant component of Palestinian identity, particularly because of Israeli colonialist attempts of appropriation. This article, however, does not delve into the Arab-Arab controversy around the intercountry identity of hummus, which is based in Lebanon, Syria, and Palestine. My “obsession” with hummus and falafel has driven me to write this article. That is, in addition to my personal experience in searching for places and spaces where I reside, in Jerusalem, in which these two meals are prevalently popular. This is an attempt to present cultural and political readings that have sprung out of this experience, keeping in mind that everything mentioned here about hummus could easily apply to falafel just the same. 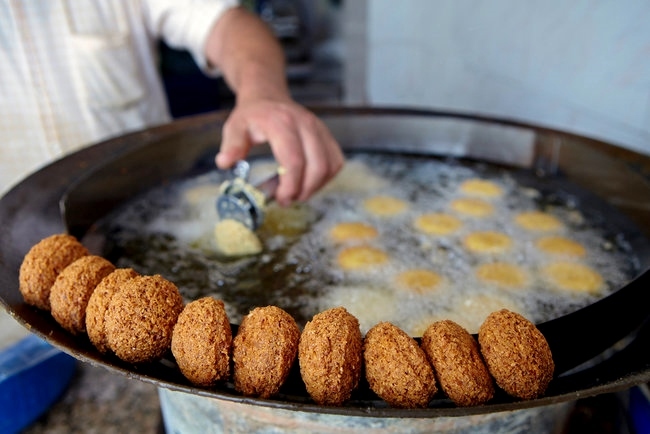 In a reality comprised of attempts to dismantle national Palestinian identity and its cultural and folkloric elements, hegemonising them for the sake of promoting a colonial enterprise, it is important to reintroduce the significance of Palestinian eats in a more mature manner, without underestimating its role in the symbolic structuring of identity and its relationship with geography and history. Nothing justifies the belief that traditional Palestinian cuisine is immune to colonialist hegemonic attempts that tamper with its indigeneity, or that it is disconnected from power struggle dynamics, which threaten its “Palestinian” character, and render it prone to change and fundamental transformation, and perhaps to fragmentation and perish. Over the course of history, colonial powers have worked towards shaping and crystallising national identity through food. Within that symbolic and intimate connection between food and identity, resistance to colonialist influences is therefore expected as a reaction. On the one hand, within macro-level Palestinian nationalism, language and shared history are usually discussed among its essential identity components, while, on the other hand, one may note a reduced interest in micro-level nationalist folkloric and traditional components. Another conviction is that youth and education could oppose the looming threats to Palestinian identity; however, this renders the role of hummus and falafel as components of that identity inconsequential, subsequently leading to reduced intervention and failure to thoroughly examine the politics that seek to truly change their features, origins, and roots. Whereas Israel claims to be the biggest commercial exporter of ready-made hummus (as opposed to a contrary Lebanese claim), and presents it as the “country’s popular national dish”, Palestinians show indifference, while awareness-raising efforts to counterbalance that claim are lacking. Perhaps they presume that its “Israelisation” will certainly fail. And what further complicates things are those who underestimate the symbolic value of hummus, and undermine its role as one of the components of Palestinian and Arab identity. Hummus and falafel are exemplary of Israel’s approach towards hegemonising their symbolism and rendering them a folkloric element of a newly established state; a “national” and economic investment is thus made in it, both locally and internationally. We are witnessing increased development in Israeli practices towards Palestinian cuisine, cuisine colonialism and cuisine imperialism, both of which comprise a process of “embracing” and dismantling. “Embracing” manifests in adopting the Arabic nomenclature of those two dishes without adaptation – “hummus” and “falafel” – away from a warped discourse (which was the case in the elimination of homemade and handmade local Arabic cheese). This “embrace” is a smart and nice form of hegemony which could create for some a naïve feeling of innocence in making peace with it. Simultaneously, there are processes of dissociating local handmade products, which take place through the deconstruction of hummus and falafel eating rituals, in addition to intensive commercial invasion of Arabic houses and restaurants. Their majority had turned to consuming commercial hummus at the expense of the local, without noticing that dissociation, whose core is suffocating the chickpea agricultural sector. Moreover, imperial practice towards these two dishes on an international level is prone to controlling meanings and producing misinformation around their identity. Hummus and falafel are a culinary state that is popularly present and rooted, natural and spontaneous. However, this state, and in the shadow of colonial reality, could unveil crises of culture and belonging, and could impede economic growth. This state must therefore turn into an essential element in the crystallisation and refurbishing of Palestinian identity. The cultural placement of these two dishes should thus be consolidated through the politicisation of their mundane production and consumption: through the discussion of popular connoisseurship characteristics, critical writing in food culture, and the documentation of this culture, such as the act of eating hummus, starting from the type of grains to the colour, shape, and presentation of the dish. For a Palestinian to be aware of what “taghmis al-hummus” (in Arabic: dipping into hummus) means and be skilled at it, renders “lenagev khummus” (in Hebrew: wiping off hummus) in direct opposition to it – the latter being an expression that is neither innocent nor mundane; rather, it has infiltrated Palestinian food spaces, seeking to hegemonise them through the exclusion of the former’s sensory and intimate connection with hummus, turning it into a relationship of consumption – devoid of meaning. Awareness of the process of elimination of sensory and intimate relations requires an initiative that embraces the significances of the culinary product and its consumption; for food is an intimate and material component in the process of building or consolidating national identity and preserving it. Treating it as such, and on that level, is considered self-preservation too (Dietler, Miachel 2001, 2007). This process necessarily means understanding the difference between hummus as a meal and hummus as a ritual, while understanding the significance of the individual and collective rituals of the meal. Awareness-raising rituals necessitate proper fathoming and polishing of the details, such as: the type of tahina used, locally-sourced parsley and its quality, local garlic, chilli pepper mix (shatta) and its ingredients, local chickpeas as opposed to “kibbutz” and imported chickpeas; likewise, the times at which hummus is eaten and its garnishes of onions and pickles, as well as individual and collective behaviour observed while eating hummus, internal arguments about the best hummus, the best falafel, and many other details that contribute to the creation of collective, cultural, and social awareness that is capable of opposing attempts of obliteration. If we were to talk about the importance of preserving the particularities linked to hummus and falafel, one must address geo-architectural spaces in those specifics; as they play a central role in consolidating the identity of Palestinian cuisine. Perhaps hummus and falafel restaurants introduce political and cultural arguments through language, pictures, and songs that define the identity of the place and its owners, whereby the places known for their hummus and falafel, such as Akka (Acre), Jerusalem, and other cities and villages, have become spaces that refuse hegemony and attempts of dissociation and marginalisation of culture and identity. Returning to space means amassing different forms of presence, such as holding hummus and falafel festivals and local contests that tend to flavour and taste, as well as historic documentation of the places and spaces where those restaurants are located. One must note, however, that collecting and documenting details around hummus and falafel would not be a first or an innovation in this context; many lands that experienced similar conflicts or disputes related to identity and belonging, countries that had been colonised, or countries whose cuisine came close to perishing have developed mechanisms for consolidating the identity of their national cuisine and documenting it. Thus, we find studies, documentary works, festivals, and restaurants around the world that are dedicated to specific cuisines, such as South Korea, Japan, Italy, Ireland, India, as well as indigenous people across South America, Canada, and Australia. In Jerusalem’s small restaurants, from Akramawi’s Hummus and Abu Hassan’s Hummus outside the walls, to Abu Shukri’s Hummus inside the walls, friendships are made, and cultural, political, and social conversations are held. Besides being mere meals, hummus and falafel have always been common details that deepen connection and belonging to the land and its people. * This article was first published in Arabic on Fusha e-zine on August 28, 2017. * Fayid Badarni is a researcher and a writer. He completed his bachelor’s degree in social sciences, anthropology, and political science, and his master's in public policy at the Hebrew University of Jerusalem. He also holds a diploma in cultural studies. He is currently writing his doctoral dissertation on civil society and the crystallisation of national identity, and has written a number of articles on politics, musical and theatrical critique, and cinema. هذه مقالة غير حياديّة، هدفها الحثّ على "فلسطنة" خطاب ووعي خاصّين بتفاصيلنا اليوميّة والعادّيّة. ومن ضمن العاديّ أكلتا الحمّص والفلافل المتلازمتان في المطبخ الفلسطينيّ، واللتان نرى من الضروريّ تطوير التعامل معهما بصفتهما جزءًا مهمًّا من مركّبات الهويّة الفلسطينيّة، ولا سيّما لما تتعرّضا له من محاولات سرقة على يد الاستعمار الإسرائيليّ. ولا تخوض المقالة في الجدل العربيّ - العربيّ حول هويّة الحمّص البلدانيّة، والذي يتركّز في لبنان، وسوريا، وفلسطين. "هوسي" بالحمّص والفلافل هو ما يدفعني إلى الكتابة، بالإضافة إلى تجربة ذاتيّة في البحث عن الأمكنة والفضاءات المقدسيّة، حيث أسكن، التي تنتشر فيها هاتان الأكلتان الشعبيّتان، محاولًا تقديم قراءة ثقافيّة وسياسيّة نابعة من هذه التجربة، علمًا أنّ كلّ ما يُذكر في المقالة حول الحمّص ينطبق على الفلافل. في واقع يتضمّن محاولات تفكيك لمركّبات الهويّة الوطنيّة وعناصرها الثقافيّة والفلكلوريّة، والهيمنة عليها، خدمة لمشروع استعماريّ، ثمّة ضرورة لطرح مكانة الأكلات الفلسطينيّة على نحو أكثر نضوجًا، وعدم الاستخفاف بدورها في الهيكلة الرمزيّة للهويّة، وعلاقتها بالجغرافيا والتاريخ. ما من شيء يبرّر التسليم بوجود حصانة ومناعة للمطبخ الفلسطينيّ التراثيّ أمام محاولات الهيمنة الاستعماريّة عليه، والعبث في أصلانيّته، وأمام ديناميكيّة ذات صلة بموازين القوى، تجعل من السمة "الفلسطينيّة" معرّضة للتهديد، وقابلة التغيير والتحوّل الجذريّ، وربّما للتفتيت والاندثار؛ فالقوى الاستعماريّة، على مرّ التاريخ، عملت على التأثير في الهويّة وبلورتها من خلال المأكولات وتوابعها. ويُتوقّع، في العلاقات الرمزيّة والحميميّة بين الهويّة والطعام، تشكّل ردّات فعل مقاومة للتأثير الاستعماريّ. في المركّبات العليا للوطنيّة الفلسطينيّة (Macro-Level Nationalism)، يُتداول من ضمن مركّبات الهويّة الأساسيّة، عادة، اللغة، والتاريخ المشترك، في حين نلحظ اهتمامًا أقلّ بالمركّبات الفلوكلوريّة (Micro-Level Nationslism) والتقليديّة، وثمّة تسليم بأنّ الحداثة وعمليّات التعلّم قادرة على مواجهة عمليّات تهديد الهويّة الفلسطينيّة الآخذة بالتطوّر، ما يجعل التعامل مع الحمّص والفلافل وكأنّهما معطًى عاديّ ومفهوم ضمنًا، ويؤدّي، بالتالي، إلى تدخّل أقلّ أو عدم تعمّق في تفاصيل سياسيّة تسعى إلى تغيير ملامحهما فعلًا، أصليّتهما وجذورها. في حين تقول إسرائيل إنّها أكبر مسوّقة تجاريّة للحمّص الجاهز (مقابل ادّعاء لبنانيّ معاكس)، وتقدّمه للعالم وكأنّه "الطبق الشعبيّ الوطنيّ للدولة"، يُظهر الفلسطينيّون ردّ فعل قليل المبالاة، ويغيب الجهد التوعويّ الوازن. ولعلّهم يعتمدون في ذلك على فرضيّة فشل محاولات أسرلته، وكأنّ الأمر حتميّ. وما يجعل الأمر أكثر تعقيدًا، وجود أصوات تقلّل من شأن رمزيّة الحمّص، وتستخفّ بدوره بصفته أحد مركّبات الهويّة الفلسطينيّة والعربيّة. الحمّص والفلافل يمثًلان نموذجًا لتوجّه إسرائيل نحو الهيمنة على رمزيّتهما وتحويلهما إلى عنصر فولكلوريّ لدولة حديثة، فيُستثمر "قوميًّا" واقتصاديًّا على المستويين المحلّيّ والعالميّ. ونحن نشهد تطوّرًا مستمرًّا في الممارسة الإسرائيليّة تجاه المطبخ الفلسطينيّ، استعماريّة (Cuisine Colonialism) وإمبرياليّة (Cuisine Imperialism)، وفي الحالتين ثمّة عمليّتا "احتضان" وتفكيك. يتمثّل "الاحتضان" باعتماد التسمية العربيّة دون تغييرها لهاتين الأكلتين، "حمّص" و"فلال"، من دون خطاب تشويهيّ كما حدث في حالة إقصاء الجبنة العربيّة البلديّة التي تُصنع بيتيًّا ويدويًّا. وهذا "الاحتضان" شكل ذكيّ ولطيف للهيمنة، وقد يخلق لدى البعض شعورًا ساذجًا وبريئًا بالتصالح معه. وفي المقابل، ثمّة عمليّات تفكيك للمنتوج المحلّيّ اليدويّ، من خلال تفكيك طقوس تناول الحمّص والفلافل، بالإضافة إلى الغزو التجاريّ المكثّف للبيوت والمطاعم العربيّة، التي أضحت بغالبيّتها تستهلك الحمّص التجاريّ على حساب البلديّ، من دون الالتفات إلى هذا التفكيك، وعلى رأسه خنق قطاع الحمّص الزراعيّ. كما أنّ الممارسة الإمبرياليّة تجاه هاتين الأكلتين، على المستوى العالميّ، من شأنها أن تتحكّم بالمعاني وتنتج معرفة مضلّلة حول هويّتهما. الحمّص والفلافل حالة غذائيّة حاضرة شعبيًّا، ومتجذّرة، وطبيعيّة، وتلقائيّة، إلّا أنّ هذه الحالة، وفي ظلّ الواقع الاستعماريّ، قد تُفرز أزمات ثقافة وانتماء، وتُحدث عرقلة في النموّ الاقتصاديّ؛ لذا ثمّة حاجة إلى أن تتحوّل هذه الحالة لمركّب أساسيّ في عمليّات بلورة الهويّة الفلسطينيّة وصقلها. ثمّة ضرورة لتعزيز مكانة هاتين الأكلتين الثقافيّة، من خلال تسييس صناعتهما واستهلاكهما الاعتياديّ؛ وذلك بتناول خصائص التذوّق الشعبيّ، والكتابة النقديّة في ثقافة الطعام، وتوثيق هذه الثقافة، مثل تناول الحمّص، من نوع الحبوب حتّى لون الطبق، وشكله، ودرجه تجويفه. أن يكون الفلسطينيّ مدركًا لمعنى "تغميس الحمّص"، وبارعًا فيه، أمر يقع في الضدّ من "ليناغيف خوموس"، وهو تعبير ليس ساذجًا ولا اعتياديًّا، بل تسلّل لمساحات طعام الفلسطينيّ، سعيًا إلى الهيمنة عليه من خلال إقصاء علاقة الأخير الحسّيّة والحميميّة مع الحمّص، وتحويلها إلى علاقة استهلاك مجرّدة من مضامينها. وعي عمليّة الإقصاء للعلاقة الحسّيّة والحميميّة يتطلّب فعلًا مبادرًا يدرك معاني المنتوج الغذائيّ واستهلاكه؛ فالطعام مركّب حميميّ ومادّيّ في عمليّة بناء أو تعزيز الهويّة الوطنيّة وحمايتها، والتعامل معه من هذه الزاوية، وبهذا المستوى، يعدّ حماية للنفس أيضًا (Dietler Michael 2001, 2007). تعني هذه العمليّة، بالضرورة، إدراك الفرق بين الحمّص بصفته وجبة مغذّية (Meal)، وإدراك أهمّيّة تفاصيل الطقوس الفرديّة والجماعيّة للوجبة (Ritual). وتتطلّب الطقوس التوعويّة استبطانًا وصقلًا للتفاصيل، مثل: نوع الطحينة، والبقدونس البلديّ وجودته، والثوم البلديّ، والشطّة ومركّباتها، وحبوب الحمّص البلديّ مقابل حمّص "الكيبوتسات" والحمّص المستورد، وأوقات أكل الحمّص، وما يرافقه من بصل ومخلّلات، بالإضافة إلى سلوك الأفراد والجماعات في عمليّة أكل الحمّص، والجدالات الداخليّة حول أفضل حمّص وأفضل فلافل، وتفاصيل أخرى كثيرة تسهم في خلق وعي جماعيّ ثقافيّ واجتماعيّ قادر على مقاومة محاولات الطمس. إذا كنّا تحدّثنا عن ضرورة حماية التفاصيل المرتبطة بالحمّص والفلافل، فلا بدّ من التطرّق إلى حضور الحيّز الجغرافيّ/ المعماريّ في هذه التفاصيل؛ إذ له دور مركزيّ في تعزيز هويّة المطبخ الفلسطينيّ. يمكن لمطاعم الحمّص والفلافل أن تطرح مقولات سياسيّة وثقافيّة من خلال اللغة، والصور، والأغاني التي تعبّر عن هويّة المكان وأصحابه، لتصبح الأماكن المشهورة بحمّصها وفلافلها، مثل عكّا، والقدس، وغيرها من المدن والقرى، فضاءات ترفض الهيمنة، ولا تقبل محاولات الإقصاء والتهميش الثقافيّ والهويّاتيّ. العودة إلى الحيّز يعني تكثيف أشكال الحضور، مثل إقامة مهرجانات خاصّة بالحمّص والفلافل، ومسابقات محلّيّة تُعنى بالطعم والتذوّق، والتوثيق التأريخيّ للأماكن والفضاءات التي توجد فيها المطاعم الخاصّة بهما. تكثيف التفاصيل وتوثيقها ليس تجديدًا في هذا السياق، فالعديد من البلدان التي شهدت صراعات أو نزاعات لها علاقة بالهويّة والانتماء، أو بلدان تعرّضت للاستعمار، أو دول يتعرّض مطبخها للاندثار، تطوّر آليّات لتعزيز هويّة مطابخها الوطنيّة وتوثيقها، فنجد دراسات، وأعمالًا توثيقيّة، ومهرجانات، ومتاحف، ومطاعم حول العالم تُعنى بمطابخ محدّدة، مثل كوريا الجنوبيّة، واليابان، وإيطاليا، وإيرلندا، والهند، والشعوب الأصلانيّة في أمريكا الجنوبيّة، وكندا، وأستراليا. في مطاعم القدس الصغيرة خارج الأسوار، من حمّص "العكرماوي"، وحمّص "أبو حسن"، وصولًا إلى حمّص "أبو شكري" داخل الأسوار، تكوّنت الصداقات، وتطوّرت الأحاديث الثقافيّة والسياسيّة والاجتماعيّة. ولطالما كان الحمّص والفلافل تفصيلين يعمّقان الارتباط والانتماء. باحث وكاتب. حاصل على البكالوريوس في علم الاجتماع والأنثربولوجيا والعلوم السياسيّة، والماجستير في مجال السياسات العامّة من الجامعة العبريّة في القدس، كما يحمل شهادة في الدراسات الثقافيّة. يحضّر لرسالة الدكتوراه في موضوع المجتمع المدنيّ وبلورة الهويّة الوطنيّة في الجامعة العبريّة. كتب عدّة مقالات في السياسة، والنقد الموسيقيّ والمسرحيّ، والسينما.